Deepcool was created 20 years ago and have been providing cases, power supplies, coolers and more ever since. With high quality and performance in mind, Deepcool have been a first choice for gamers, modders and overclockers and with such a wide range of products there is something that should suit everyone. Part of the Deepcool product line is the "Gamer Storm" range, as the name suggests this is a range geared towards the gamer with a range of really nice looking products from fans to AIO coolers. 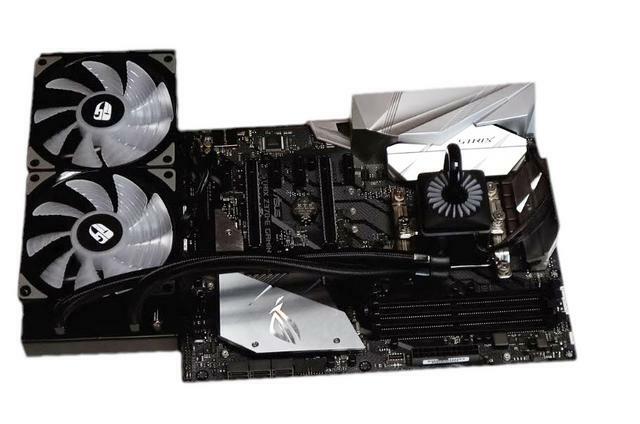 One of the latest additions to the Gamer Storm range is the Captain 240 Pro, an AIO Liquid cooling solution that has been made to look good, run quietly and perform well. 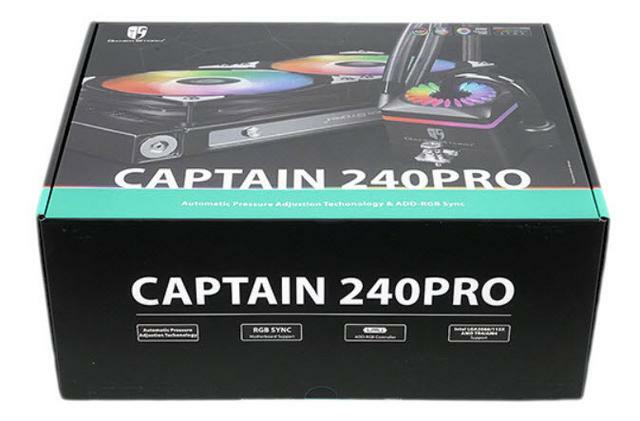 The Gamer Storm Captain 240 PRO is an upgraded version of the Captain 240 RGB. It is part of a wider range of Captain products, such as the single fan Captain 120 or the triple fan Captain 360. 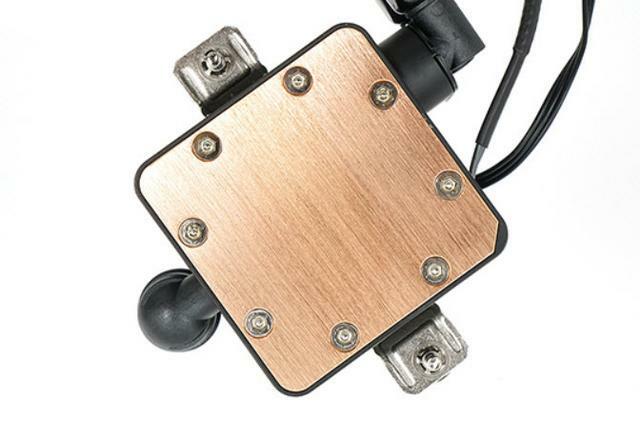 Captain 240 PRO comes with a patented automatic pressure adjustment function-Patent NO. :201820725976.9, which is capable of adjusting the pressure inside the water cooling device automatically, as a result, ensuring stable operation and extending overall life. With this update including new features and, of course, RGB lighting, we expect big things from this. We fully expect Deepcool to not disappoint! The Deepcool Gamer Storm Captain 240 Pro ships in a dark box with unmissable RGB accents - welcome to 2019! 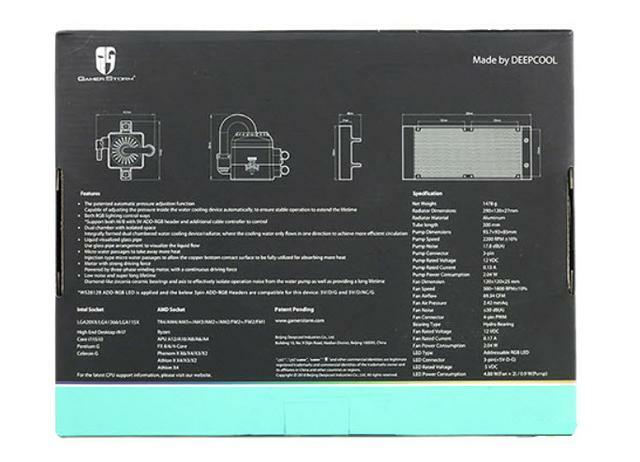 The front of the box showcases a large image of the cooler and its unique pump. The back has a diagram showing the pump and the radiator measurements so users can assess whether it will fit in their system. The left side shows a few of the cooler's features, such as its 120,000 MTBF, FDB fan bearings and powerful motors. The right side is the same as the left. The bottom is much the same as the right and left sides. It's not until you get to the top of the box that you find a short list of the cooler's features and some more specifications. Inside, the contents of the package are compartmentalized in a recycled cardboard cradle and further wrapped in plastic individually. Suffice it to say that Deepcool's packaging is, once again, more than adequate as it does provide the necessary protection the product needs. 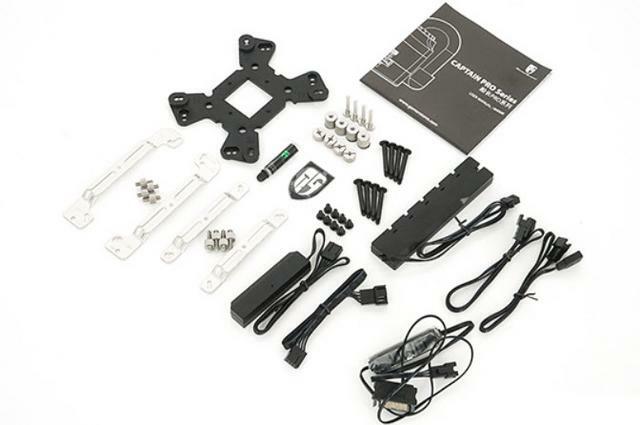 Components include: 8 long screws for fixing the fan, 8 case fixing screws, 4 back plate, 4 fixing screws, nut A 4, nut B 4, thermal compound, ADD-RGB Controller, ADD-RGB extension cable Type-A, ADD-RGB extension cable Type-B, RGB hub, cooling fan hub, fan extension line, 3 brackets, 4 LGA 20xx bolts and 4 TR4 bolts. 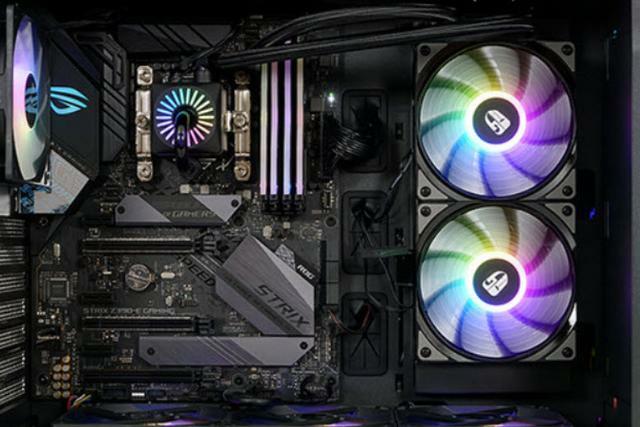 There are quite a few cables for connecting and controlling the fans, and CPU blocks LEDs.The Gamer Storm Captain 240 Pro also boasts support for all major motherboard lighting software packs, Asus Aura Sync, Gigabyte RGB fusion, MSI's Mystic lighting Sync, and ASRock's Polychrome Sync. 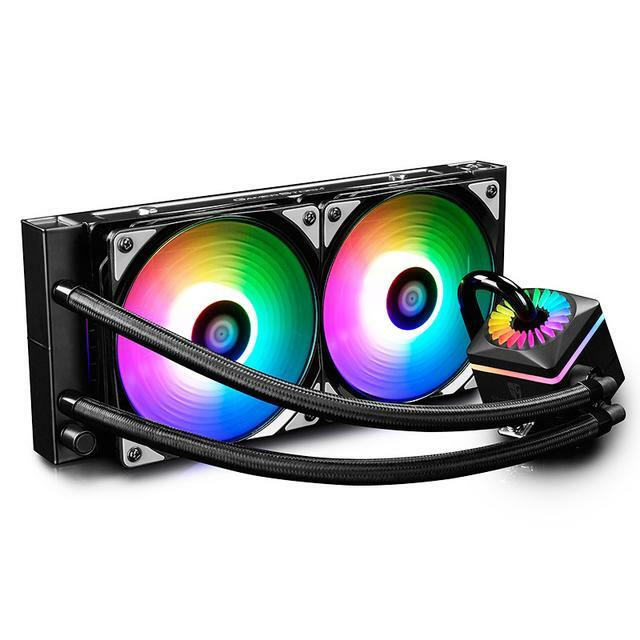 Deepcool comes with a new built-in PWM fan hub. The size has been changed to be slimmer than the existing hub. 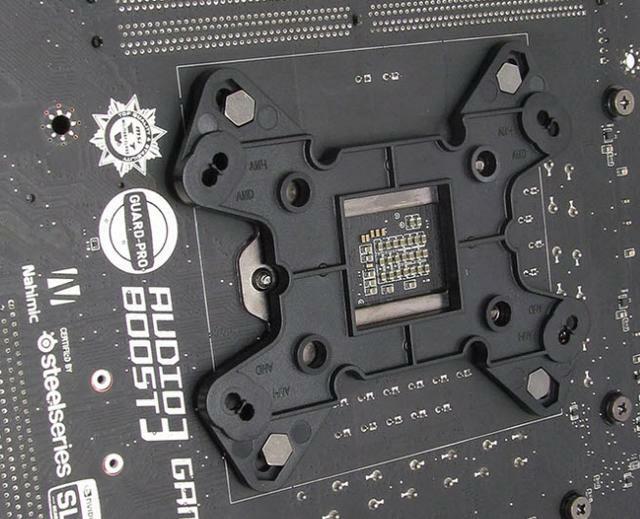 RGB hubs are also built in to allow connection of up to five ADD RGB pinheaders. The 240mm standard radiator is made of aluminum. 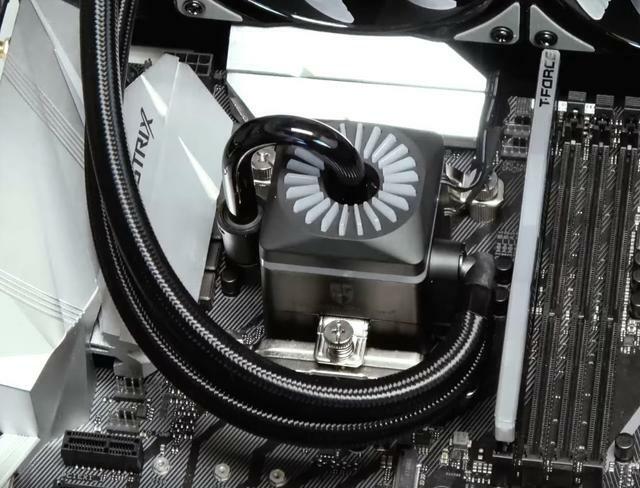 The integrated dual-chamber water cooling device/radiator is where cooling water flows in only one direction to achieve more efficient circulation. The tube is made of fluorinated ethylene propylene material to enhance the durability. 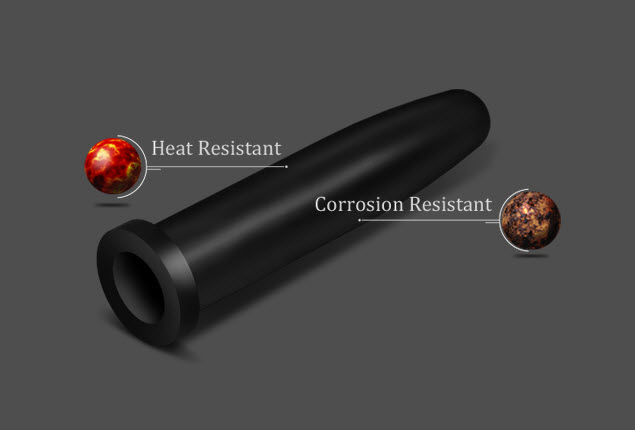 The expander that surrounds the tube is finely finished so that the inside does not shine through the triple coating. 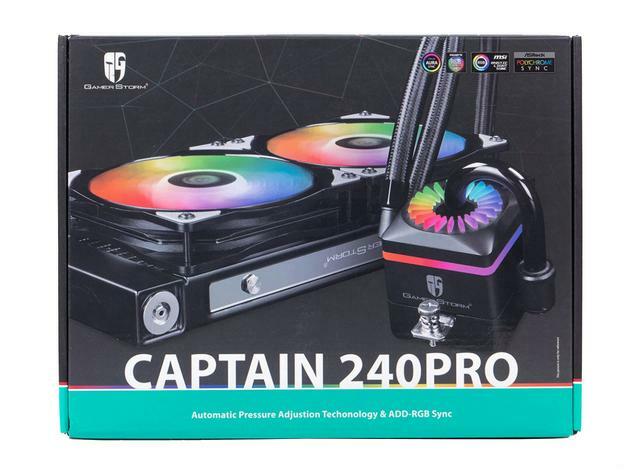 The Gamer Storm Captain 240 PRO's shape and design are mostly integrated into the previous generation's captain 240RGB, but a pressure relief valve and a metal nameplate have been added to the cold row. 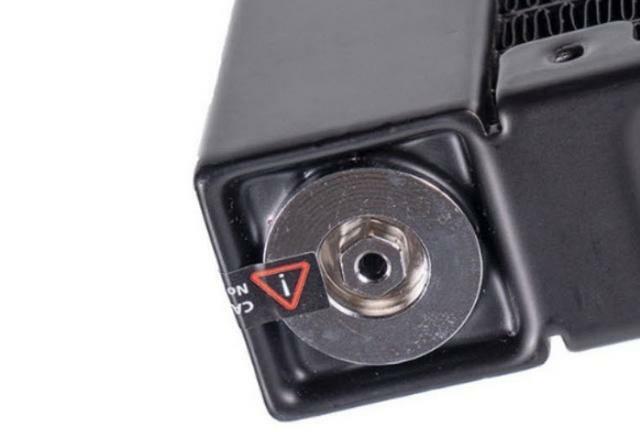 The automatic pressure relief valve, which is one of the biggest upgrade highlights of the Captain 240PRO, incorporates a patented automatic pressure regulation technology that claims to achieve zero leakage. The pressure valve may be the gas that evaporates from the original water-cooled liquid, which may be seen in the split water cooling. Inside the radiator, an elastic pressure-relief bag will be added with one side exposed to the air and the other side dipped in the coolant. When the internal pressure exceeds atmospheric pressures, the bag will be squeezed and thereby increases the system’s internal volume. As a result, the increased pressure is released and the risk of leakage is avoided. 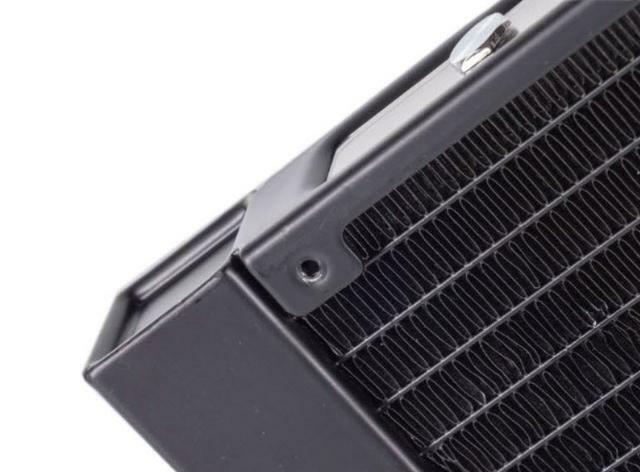 Although the liquid cooling radiator features low noise, high radiation efficiency and other advantages, its potential safety hazards shouldn’t be ignored. While the cooler is working, the coolant’s temperature rises, so will the volume expand. Sometimes gas can be generated within the system, which will further increase the system’s pressure. When the pressure exceeds the system’s critical levels, a leakage will occur. The pressure-relief bag is made of premium EPDM material produced by DuPont ( E. I. du Pont de Nemours and Company ).The material possesses properties such as elasticity, anti-corrosion, resistance to ageing and resistance to the impact of high/low loading. The cold fins are designed with a flap to increase the area of the fins and the heat transfer effect, and improve the heat dissipation efficiency. 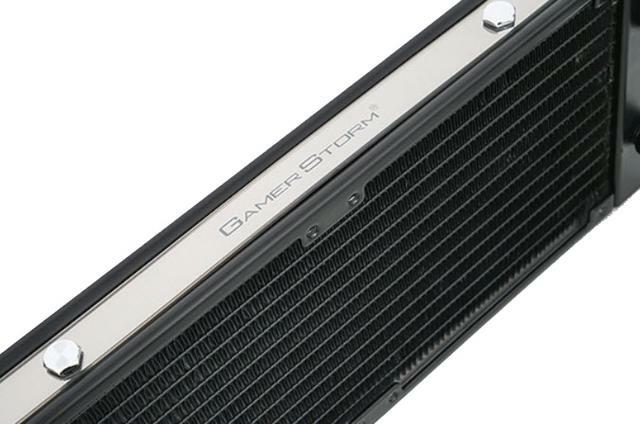 The side of the radiator has a big stainless steel plate with the GamerStorm logo cut into it. 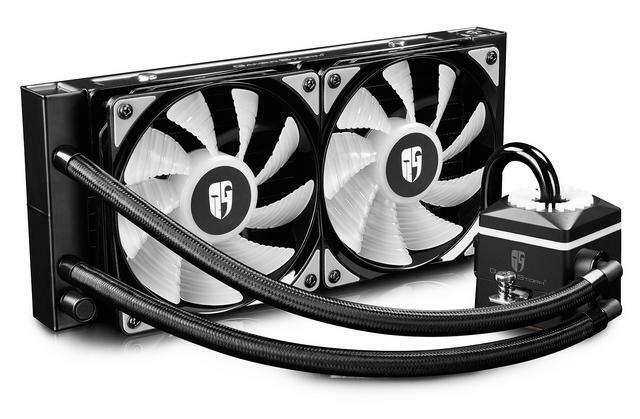 The Gamer Storm Captain 240 PRO has rubber tubing that is sleeved for a cleaner look. You would have nothing to fear from pinching here and the length should be more than acceptable for any system build. Fittings can obviously not be changed since this is a closed-loop cooler. The pump block unit stands 85mm tall, with a clear hard tube visibly moving the coolant from the bottom to the top compartment. On the other side, the two tubes act as the intake and the other taking the fluid through the radiator assembly. The cabling for the RGB LED of the reactor and the pump power is also located on the same side as the tubes. 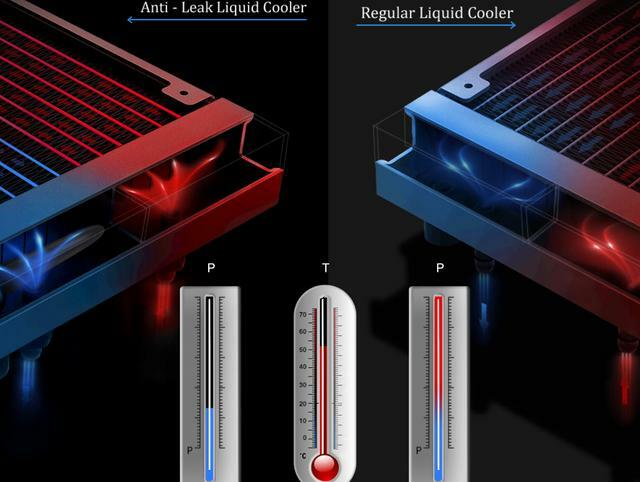 The "Visual Liquid Flow Design", as Deepcool calls it, further adds to the cooler's appearance, that's the glass tube coming out the top for those wondering. Meanwhile, the fittings on the pump have an okay range of motion. The three-stage induction motor in the sealed impeller quickly circulates the cooling water, and the zirconia ceramic bearing guarantees a lifetime of 120,000 hours. 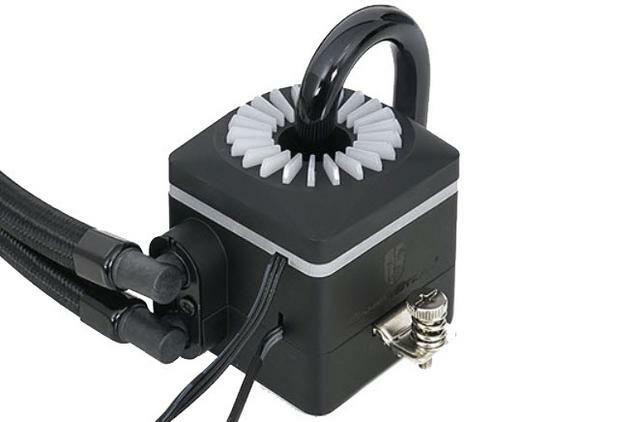 The water-cooled head has two connecting lines, one is the 3Pin interface for power supply and speed, and the other is the 3PinRGB data line for RGB light control. 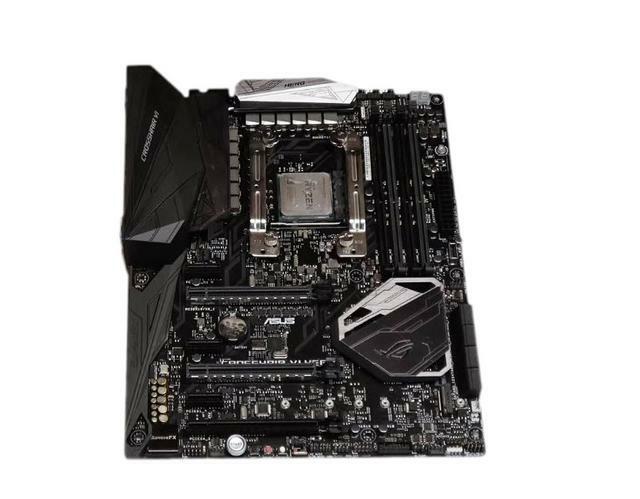 In addition to being controlled by RGB lighting controllers, the Gamer Storm Captain 240 PRO also supports the RGB interface lighting effects synchronization of MSI, ASUS, Gigabyte and ASRock motherboards. When it comes to the base, it's smooth to the touch and clear of any serious machining marks. 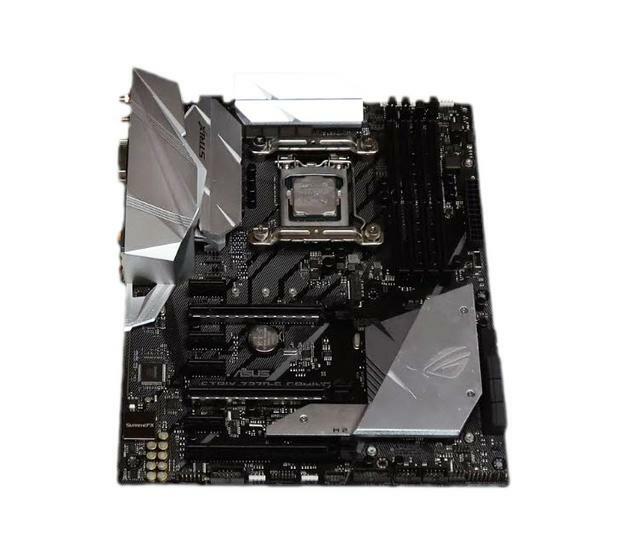 The contact plate is a nice large size (compatible with the AMD Ryzen Threadripper TR4 socket), and with the squared profile, which should extend beyond the edge of your processor comfortably, coverage is no issue. 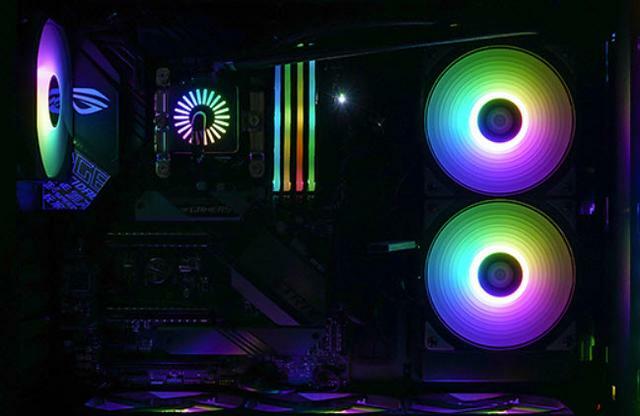 Also included are 2 Deepcool 120 x 120 x 25 mm fans with PWM control (4-pin connector) that offer addressable RGB LED lighting on the blades, so we can generate powerful lighting effects on them. They are generating a sound of low decibels. This is, in part, thanks to the anti vibration system mounted by each of the fans and the graphite bearings, which generates less friction and vibration when working at maximum performance. Installation is quite simple. First, position the backplate on the motherboard with the proper screws. Then, using the provided pillars, secure the backplate to the board. With that done, secure the mounting arms to the pillars. Next, apply some thermal paste and secure the pump block to the mounting arms. Finally, install the fans to the radiator and plug the fans and pump into their proper motherboard headers. Once done, connect the RGB wires to the controller or proper motherboard header and you are done. 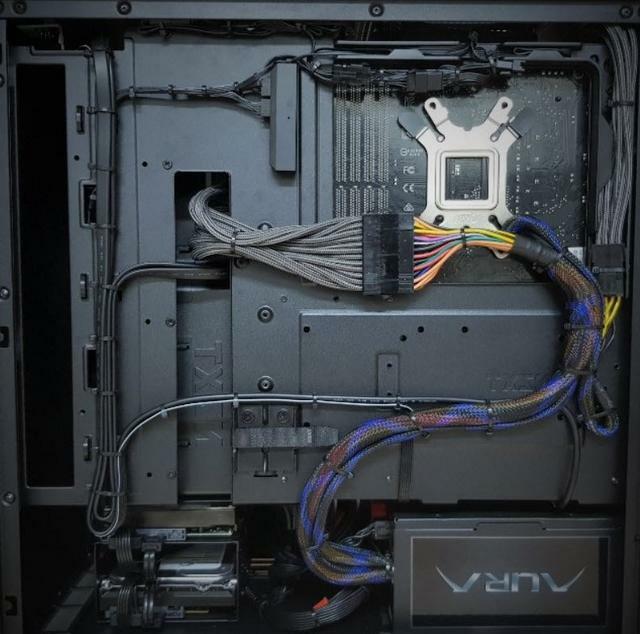 Once physically installed in your case, you can plug in the fans, using the included fan splitter hub, and choose the correct adapter for connecting the RGB LEDs. Plugging the fans on the in-line controller provides seven color options which can be set to alternate quickly or in breathing mode. The speed which the LED behaviour changes can be adjusted with the controller as well. 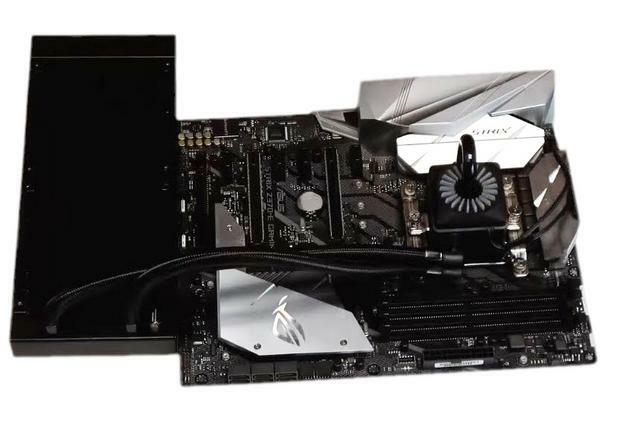 Plugging the pump block LED directly on the motherboard header opens up greater customization options. 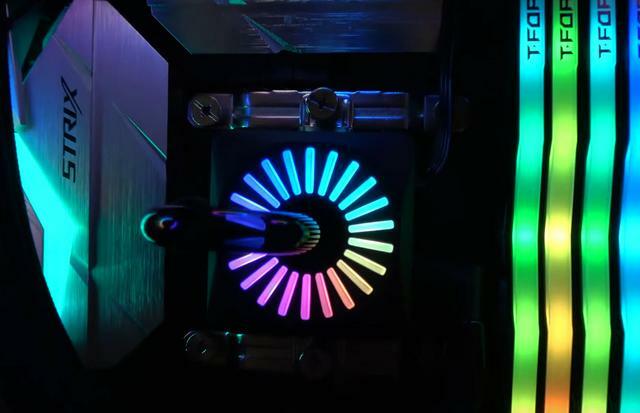 With the cooler's LEDs powered up, you get a much better idea of why the addressable RGB LEDs are something to shout about. Standard pulsing on and off, and static colour modes are also available through the controller, but one of the better-looking options is the rainbow spiral effect which transitions through colours incredibly smoothly. 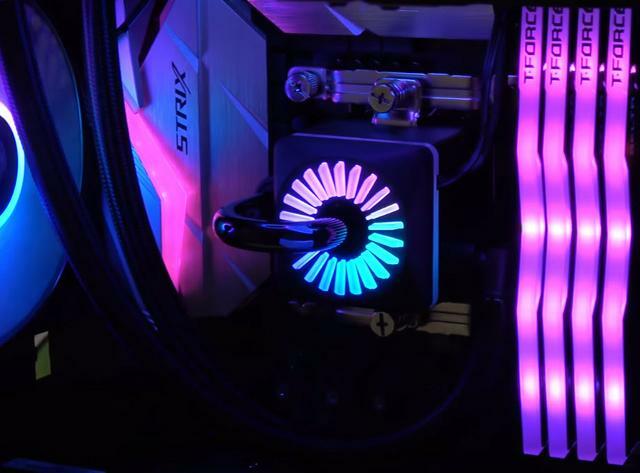 The lighting is not just on the pair of 120mm fans (each having 6 LED pieces), but on the pump-block as well. 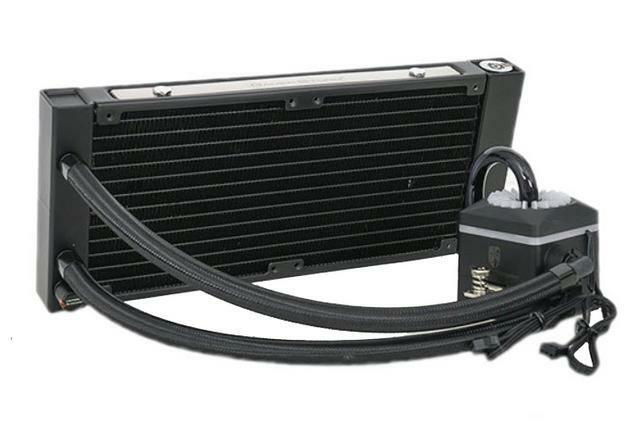 As with pretty much every closed-loop liquid cooler, clearance is more than adequate. There are no obstructions around the socket to speak of. System memory is not limited by height, nor is the choice of GPU on Mini-ITX systems. Prime 95 and is run for 10 minutes and then the average maximum temperatures as recorded by CPUID HWMonitor are noted.The average temperature across the four cores is taken on our quad core processor.Celsius temperatures are used and i keep the ambient at 22 (+/- 1) degrees for all testing.Celsius temperatures should correct for any marginal ambient differences between 21-23 degrees.Acoustic measurements are taken 10cm horizontally away from the CPU cooler with the VGA fan disabled,hard drive in idle and power supply isolated. 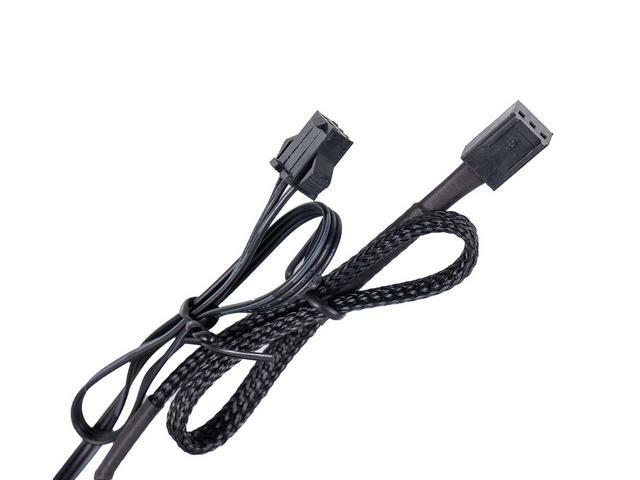 These are taken at desktop idle and Prime95 load.Voltages are fixed to prevent inaccuracy between comparisons. Each test is repeated 3 times with 3 remounts for consistency of results. There is nothing to worry about at Stock Load test. 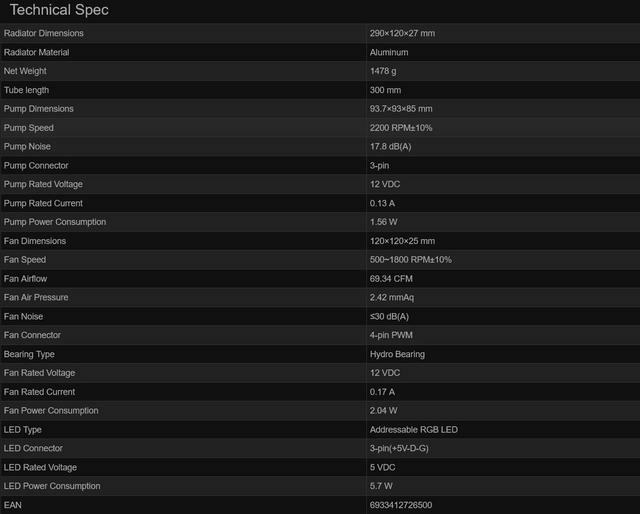 The overclocking results for the Captain 240 Pro are simply just exceptionally impressive. When you remember that this is only a 240mm cooler, it’s remarkable that it beats some of it’s larger ‘high-performance’ rivals. The noise levels for this cooler are simply amazing. 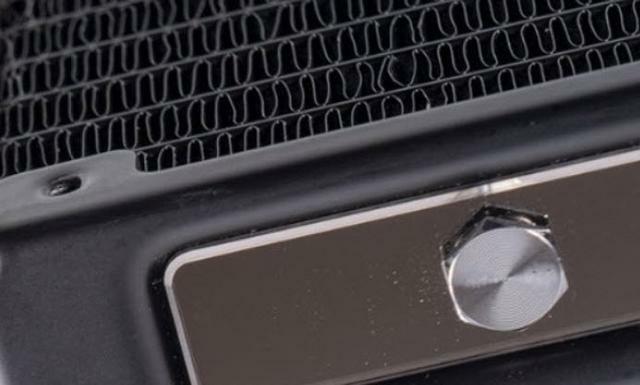 Deepcool says that the fans are designed for minimal noise output and they were not kidding. To say it’s silent would be an exaggeration, but honestly, between the other ambient noises of a standard PC system, I’m not convinced these fans added anything to it! 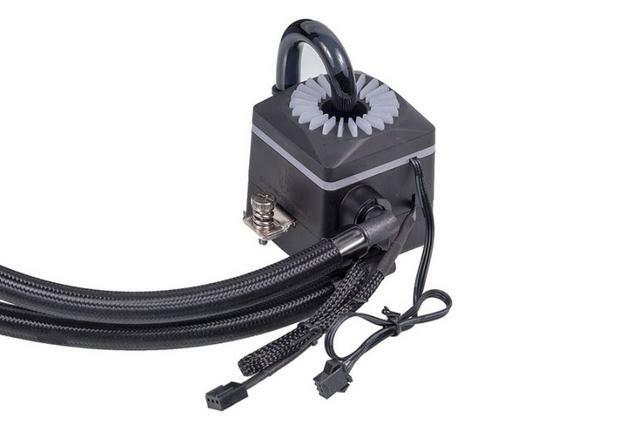 The Deepcool Gamer Storm Captain 240 Pro is one heck of an All-In-One liquid CPU Cooler. All the changes that Deepcool did helps the new Captain Pro series perform and look better than the Captain series that came out at the beginning of 2015. 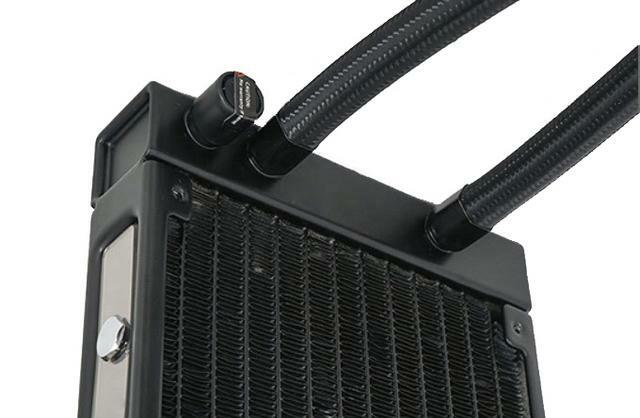 A big hats off to Deepcool and Gamer Storm systems to come up with this new series of 240mm coolers. Deepcool does not have a 280/360mm Captain Pro model available right now and they have not informed us of any plans to bring one to market. Lots of manufacturers are packaging LEDs, and RGB functionality into their cooler, Deepcool being no exception, but the new Gamer Storm Captain 240 Pro adds to their product an air of supremacy. Don’t think that just because this has RGB lighting that it’s not a serious contender. Our test results clearly indicate that the Deepcool Gamer Storm Captain 240 Pro, while fun on the surface, is all business too! 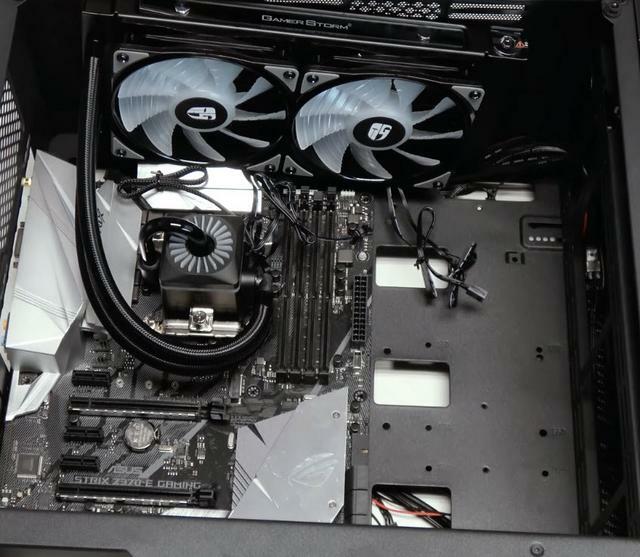 The Captain 240 Pro’s cooling performance was so impressive that I thought something was wrong, but with further testing and re-testing, the Captain 240 Pro proved to be one of the best AIO coolers we have tested. The icing on the cake is that the build quality is also stellar. It has an automatic pressure relief valve that automatically adjusts the pressure circulation inside the water cooling to reduce the possibility of liquid leakage and further ensure the safety of integrated water cooling. Installation is very straightforward and simple. After spending some time with the Deepcool Gamer Storm Captain 240 Pro our only gripe with the unit is that it has a ton of wires. You’ll need to sit down and do some serious wire management to make your installation look professional! Hopefully Deepcool can come up with an innovative solution for the wiring on future series to make installation even easier down the road. 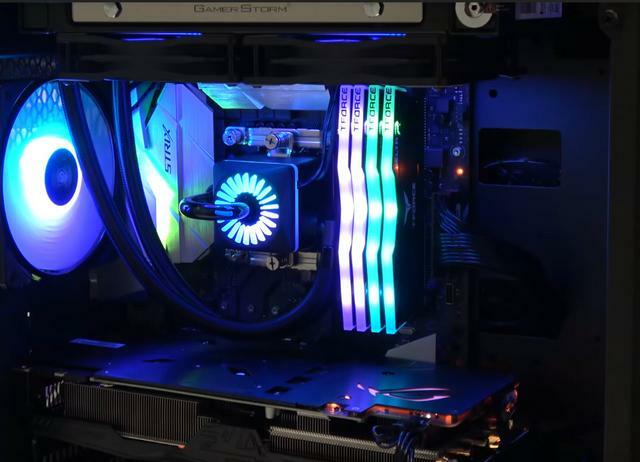 The RGB illumination looks great, and there are tons of options. The flexibility for connecting to both your motherboard for software control, or use with the remote is really pleasing to see. 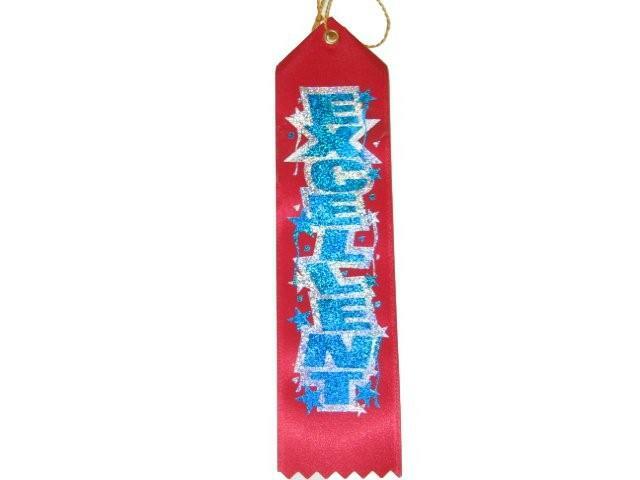 We would, however, put extra emphasis on the performance. With the near silent fan operation, to achieve tests results as solid as those we saw here is very impressive indeed. 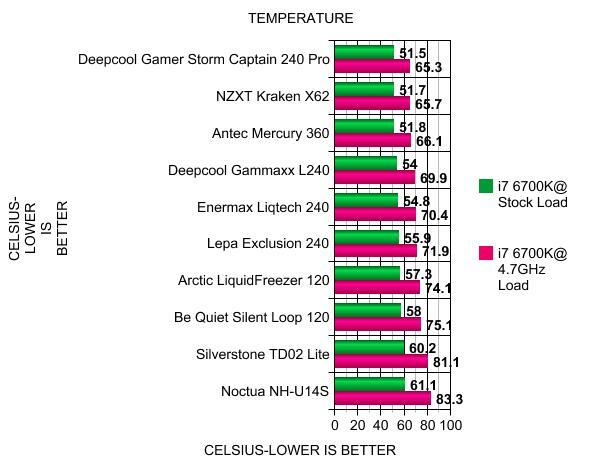 The Deepcool Gamer Storm Captain range of CPU coolers has enjoyed an excellent reputation of being one of the best and affordable coolers on the market. This updated model is no exception to that rule. 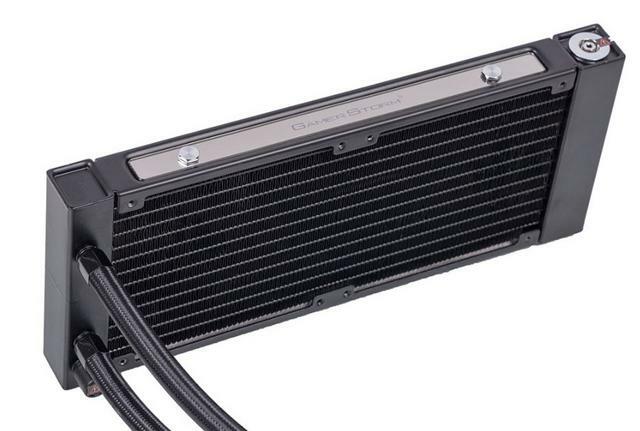 Retailing for a price of $115, this is without a doubt one of the best value coolers on the market in terms of price to performance. The test results alone clearly indicate that this cooler is capable of outperforming many of its competitors. A significant amount of which comes with a much higher price tag and far more complicated (and less convincing) design. 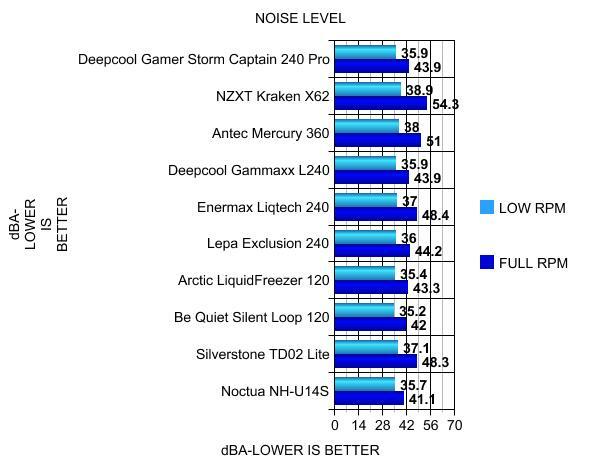 When you take this into consideration, the Deepcool Gamer Storm Captain 240 Pro is truly excellent! Last edited by testman78; 04-03-2019 at 08:43 PM. Pretty much in line with most reviews I saw. Except one where it failed completely, I guess there might be some user error there..